PARIS, France, June 7, 2010 (ENS) – Ethiopia and Zimbabwe have added their first biosphere reserves to the network of reserves created by the United Nations to halt the loss of biodiversity and promote sustainable development. One of the two new Ethiopian reserves protects the place of origin of the plant Caffea Arabica, believed to be the first species of coffee ever cultivated. The decision to include the reserves in Ethiopia and Zimbabwe was taken by the International Coordination Council of UNESCO’s Man and the Biosphere Programme, which concluded its annual session Friday at UNESCO Headquarters in Paris. The Council also added 10 biosphere reserve sites in Iran, Mexico, Nicaragua, Peru, Poland, Slovenia, South Korea, and Sweden, while five sites were extended in Chile, Costa Rica, Finland, Germany and Switzerland. The World Network of Biosphere Reserves now numbers 564 sites in 109 countries. Biosphere Reserves are areas designated under UNESCO’s Man and the Biosphere Programme to serve as places to test different approaches to integrated management of terrestrial, freshwater, coastal and marine resources and biodiversity. They are protected areas that are meant to demonstrate a balanced relationship between humans and nature. This year’s Council meeting coincides with the International Year of Biodiversity designated by the UN General Assembly to promote the protection of the planet’s species and habitats. Kafa, Ethiopia, stretches over more than 700,000 hectares containing more than 50 percent of Ethiopia’s remaining Afromontane evergreen forests ecosystems. 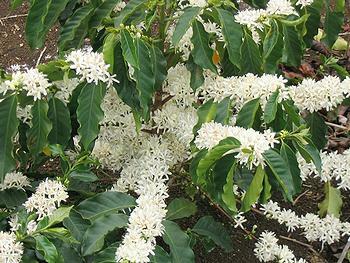 It is the place of origin of the rare and critically endangered Coffea Arabica. Numerous fertile valleys and lowlands link the mountains and ridges, and are marked by waterfalls, including the Barta and Woshi falls. Public-private partnerships for economic growth and efficient use of resources have been implemented successfully in the area and can serve as models for new initiatives such as sustainable coffee production and marketing. Yayu, Ethiopia, in the southwestern Illubabor Zone of the Oromiya Regional State, is part of the Eastern Afromontane Biodiversity Hotspot, one of the world’s 34 vital yet threatened areas for biodiversity conservation. Undisturbed natural forests and semi-forest systems are managed for the production of coffee, spices, honey and wood while providing ecosystem services such as watershed protection in the Nile Basin. The Yayu forest has the greatest abundance of wild Arabica coffee anywhere. Fruit trees are grown as crops and to provide shade for the coffee. Dena, Iran, stretches semi-arid steppe forests across the Central Zagros Mountains. Oak species predominate in the highlands, with pistachio and almond trees at lower elevations. Large rivers, including the Karun, Dez, and Kharkeh, originate from the Central Zagros, forming waterfalls, pools and lakes before draining into the Persian Gulf and the Caspian Sea. The area is home to a large rural population, including a nomadic community of about 20,000 people practicing traditional livelihoods. 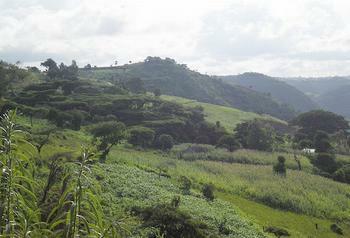 Development priorities are sustainable range management and ecotourism. Naha-Metzabok, southeast Mexico, covers the northern part of the Lacandona forest, the biggest tropical forest in the country. An integral part of the Mayan Forest biological corridor, it has regional importance for conservation. The diversity of the population of more than 6,500 indigenous people including the most ancient Maya-Lacandon as well as Tzeltales and Choles communities, adds high cultural value to the site. Los Volcanes, Mexico, is a volcanic landscape that includes Popocatepetl, one of the most impressive active volcanoes on the planet, and a variety of endemic species, such as the volcano rabbit. The area serves as a water catchment for Mexico City, which has the highest population density in the country. Projects for reforestation, soil rehabilitation and groundwater infiltration are being developed to protect the water supply. Maria’s Island, Mexico, is a reservoir of endemic species that developed over eight million years of insularity with dry tropical forest, mangroves, swamps and coral reefs. The National Institute of Ecology, the National Commission of Natural Protected Areas and the Secretariat of Public Security have introduced sustainable management projects, such as reforestation and agriculture, to rehabilitate the prisoners at a federal penitentiary on the island. 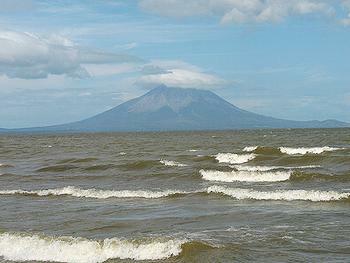 Ometepe Island, Nicaragua, is an island biosphere reserve in the biggest freshwater reservoir in the country, Cocibolca Lake or Lake Nicaragua. The site’s name in the local Nahuatl language is “island of two hills,” referring to its two volcanoes. The lake supports freshwater sawfish and sharks. Inhabited by some 30,000 people, the pre-Columbian petroglyphs, statues and ceramics demonstrate its long history of human settlements and enrich community-based ecotourism. Oxapampa-Ashaninka-Yanesha, Peru, is part of the country’s Amazonian high forest region. This conservation hotspot is under intense pressure from human activities such as deforestation, causing loss of biological diversity. The biosphere reserve has developed participatory management processes involving regional authorities, NGOs and the local population. The presence of indigenous cultures, such as the Yanesha and Ashaninka, helps preserve ancestral knowledge in managing natural resources and developing agro-forestry, ecotourism and artisanal crafts. Tuchola Forest, Poland, is one of the biggest forest complexes in the country, located in the northwestern Pomerania region, about 50 kilometers southwest of Gdansk on the Baltic coast. About 17,000 people live in the biosphere reserve’s buffer zone, making their living by tourism, logging and hunting as well as picking mushrooms and berries. Agro-tourism – combining tourism, recreation and craft development – has become a booming economic sector in the transition area. Gwangneung Forest, South Korea, is located in the central part of the Korean peninsula where the extreme continental climate of northeast Asia and the oceanic climate of the Pacific meet. Deciduous hardwood forests over 500 years old, the Royal Tombs of the Joseon Dynasty, a UNESCO World Heritage site, and the Korea National Arboretum are within the biosphere reserve site. Planned sustainable development activities include eco-labeling of local goods, development of renewable energy resources and promotion of organic agriculture. Kozjansko and Obsotelje, Slovenia, between the Sava, Savinja and Sotla rivers, represents a mosaic of Alpine and Panonian landscapes. To the east, the reserve borders Croatia. Forests cover over 55 percent of the site, and the Kozjansko Regional Park makes up large part of the core area. Eleven communities live within the site – all involved in sustainable development projects such as alternative and ecological farming, sustainable tourism, production of traditional foods and crafts. Lake Vanern Archipelago, Sweden, includes the largest lake in Sweden, which is the third largest in Europe. In the site’s center is Mount Kinnekulle, with a species-rich fen, called Skebykarret, to the southwest. Along the 350 kilometer (217 mile) long Lake Vanern are reed areas rich with diverse birdlife. Some 60,000 people live within the site; the transition area incorporates several city centers. Sustainable travel, ecotourism, fishing, agriculture, forestry and tourism are of economic importance. Middle Zambezi, Zimbabwe, stretching over some 40,000 square kilometers in the Zambezi valley, features unique riverine and terrestrial ecosystems, including a large human-made reservoir, Lake Kariba. 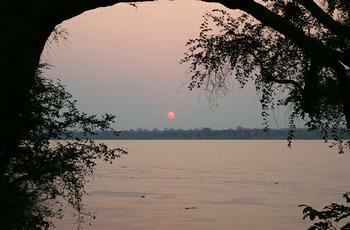 The Mana Pools National Park, part of the core area, is a UNESCO World Heritage Site. Controlled safari sport hunting in parts of the buffer zone and fishing in Lake Kariba provide employment for hundreds of people. Araucarias Biosphere Reserve, Chile, originally designated in 1983, has been extended to 12 times its original size. The site, in the south of the volcanic Andean chain in south-central Chile, now covers an area of 1,140,000 hectares and includes 105,000 inhabitants. Mapuche indigenous people live mainly in the transition area. Increasingly rare forests of araucaria, endemic evergreen coniferous trees, are found here. Cordillera Volcanica Central Biosphere Reserve, Costa Rica, originally designated in 1988, has been extended to five times its original size. It now covers some 650,000 hectares and is home to a population of almost three million people. The extended site, now including the city of San Jose, will provide for improved management. Archipelago Sea Area Biosphere Reserve, Finland, established in 1994 in connection with the Archipelago National Park, is a unique coastal area in the Baltic Sea with thousands of islands and skerries. The total surface is now 5,400 square kilometers, of which 4,580 km2 is water. The area is inhabited by 3,850 residents who fish and farm. There are also some 8,000 summer cottages in the biosphere reserve and the region serves a recreational area for 150,000 people annually. Projects for the biosphere include the management of ecologically valuable pastures. Berchtesgadener Land Biosphere Reserve, Germany is the only alpine biosphere reserve in Germany, with 103,000 people living in the extended transition area. Inhabitants engage in agriculture, forestry, salt mining, small-scale industry and crafts, retail trade, health services, tourism and resorts. Research focuses on the local effects of global climate change, especially on alpine vegetation. The Reservat da Biosfera Val Mustair-Park Naziunal, Switzerland, now includes a buffer zone and a transition area east of the main core area, including local municipalities and villages, in particular Val Mustair to the southeast of the original Swiss National Park and Biosphere Reserve. Further extensions to the site to be implemented before 2013 were agreed between the Council and the Swiss authorities.